Click on links below to jump to content on the page. Protected agriculture – a broad category that includes vertical farming – has been adopted widely in North America over the past two decades. While vertical farming has gotten much attention recently, it might be most helpful to consider it an offshoot of the larger trend toward protected agriculture, rather than the market disruption that some proponents claim. The number of new entrants into the market has fallen short of expectations, but existing players have been successfully expanding their operations in highly populated markets, including the greater New York City and Chicago areas. While the largest participants in vertical farming to date are based on the classic wholesale production model, smaller producers may find it advantageous to partner with other innovative enterprises as a point of differentiation: the wholesale model usually leads to competition on costs. Another characteristic of indoor/vertical crops is their reliance on the fresh market. For a variety of reasons, processing fruit and vegetables nearly always receive a much lower price than their fresh counterparts. Many crops are grown for processing (e.g. frozen or canned), in addition to fresh uses. While indoor-grown produce may eventually compete with outdoor-grown produce in the higher-value fresh market, it is unlikely to be competitive with processing-grade product, with prices that are 10 percent to 50 percent of the fresh market value, depending on the product. A general rule of thumb holds that processing represents around 40 percent of North American vegetable demand. The Newbean estimate assumes that all consumers will prefer local vertical production, regardless of cost. This is unlikely. According to the same study by the Hartman Group cited in the Newbean Capital report, the consumers who are most interested in sustainable (including local) products are likely to represent less than one-third of total consumers. This further constrains the potential market for indoor-grown produce. It is often more useful to examine local markets on a case-by case basis. The profusion of vertical farm startups in the New York and Chicago metropolitan areas suggests that factors such as population density, consumer lifestyles, and lack of local supplies make some markets more profitable than others. Another significant barrier is the limited availability of large, suitable urban space for more than small-scale, niche production. For example, after opening its first rooftop facility in the urban core, Canadian producer Lufa Farms had to build its second facility in the outlying suburbs of Montreal. AeroFarms, with several operations in Newark, New Jersey, has been able to take advantage of unused urban space in this area, but it is not difficult to imagine that real estate values will eventually increase precisely in the areas most suitable for urban indoor production activities. While studies in New York City, Portland (Oregon), Oakland (California), and other cities have estimated a fairly large amount of total surface area that might be suitable for high-intensity urban agriculture, much of this space is distributed in small, irregular parcels with inadequate infrastructure. This could result in high management costs and can limit the scale of many operations. A final note on the competitiveness of indoor-grown produce is related to the effects of supply on market pricing. Currently, fresh produce pricing fluctuates according to seasonal availability. Traditionally, this has favored producers who can deliver product in the weeks when supplies are scarce. As more producers enter the market in pursuit of these higher prices, increased supply will tend to drive down prices. As a result, indoor farming operations that project revenues based on higher, off-season market prices, or even average market prices, could be overestimating their sales potential by a large amount. Operating models include wholesale-only growers, who essentially perform the same role as other produce growers, just in a different growing environment. Some firms establish a retail channel as well to capture higher prices, for example through farmer’s markets, food box delivery, or direct internet sales, though this will increase marketing costs and require additional expertise. Producing branded items can sometimes capture premium pricing compared to private label or bulk product, but again, this requires building brand equity, which requires time and expertise. Value-added products, such as juices, extracts, and sauces, can bring in revenues in excess of the processing costs, and can be marketed independently to a wider geographic audience than fresh products. Finally, some growers have developed proprietary growing systems that they are attempting to sell (e.g., Los Angeles-based Local Roots) or license (Urban Produce, LLC). The optimal product mix will result from a careful study of the local market, given the limits of vertical farming technology addressed in this report. Partnerships also have the potential to help companies generate higher returns, provide access to funds (such as grants) that may not be available to the private sector, enter the market with higher visibility, and access emerging technologies earlier than competitors. Key players in each segment are summarized below, with more detailed profiles included in the Appendix. The following companies are currently producing at a commercial scale in the U.S. and Canada. All figures are estimated based on publically-available data and a composite estimate of wholesale market prices. Note that some recent entrants (VertiCrop in British Columbia and Vertical Harvest in Jackson Hole, Wyoming) are not yet included as they do not appear to have generated enough data to evaluate. *Based on wholesale composite price of $1.25/lb for leafy greens. Retail operations see higher returns. Product photos look dated (fluorescent bulbs). Not sure if they are now using contemporary LEDs, etc. Leafy Green Machine: 40-foot shipping container. Smaller unit in development. Claims to achieve higher yields than any other system. Optimizes inputs based on cost as well as physical condition. Lettuce only at this point. One container = 4 tons of lettuce per year. Working on solar power, produce processing tech. Flagship product, PlantFactory, is a “turnkey, robotized, climate controlled plant factory built according to your needs.” Pricing assumed to be high end. 5,000-6.1 million individual plants per growing cycle. 91,000-111 million per year. Also developing branded components for sale (lighting, substrates, nutrients, and seeds). System makes use of a truly vertical growing configuration, instead of the more common stacked shelf model. The ZipFarm is an integrated system that includes modular growing racks, lighting, and control systems that can be installed in a multitude of indoor spaces. Also provides consulting services based on experience gained at its growing facility in Ontario. Structural (panels, shelves, racks, containers). While some greenhouse manufacturers do not necessarily specialize in indoor/vertical farming, some specialty equipment does cross over, and greenhouse manufacturers also have experience in building equipment designed to withstand extreme conditions. Fluence (Austin, Texas) - https://fluence.science/ - has developed a purpose-built lighting system for vertical farming operations, designed to eliminate bulky fixtures and provide uniform lighting to dense indoor planting configurations. System design and agronomic recommendations are often included with the purchase of high-end systems, though production personnel should already be well-acquainted with everyday operation and maintenance of any system to be used in an operation. Food safety is a critical issue with any food product, and the laws apply equally to hydroponic and aeroponic indoor growers as they do to traditional growers. In some cases, customers will specify the particular food safety programs and plans their suppliers must have in place, such as Hazard Analysis and Critical Control Points (HACCP), as well as certification and auditing processes. In addition, insurance policies should provide coverage for food safety incidents. The success of vertical farming operations will likely be driven by two related factors: a long-term decline in the costs of the technology, and improved production efficiency (yield) for a given footprint. Lighting is the most significant element of an indoor vertical growing operation. Not only does it account for the bulk of energy use in a system, it also plays a pivotal role in plant growth, including yield and time to maturity. Innovations in LED technology, including lights that emit only the frequencies necessary for photosynthesis, as well as general improvements in energy efficiency, are reportedly reducing costs at rates comparable to those in the computer chip industry. In addition to continuing reduction in costs, newer systems are also being designed to make more efficient use of the light spectrum, especially in enclosed spaces crowded with plants. Growing media for hydroponic systems represents a fairly mature category. Advances in materials science may improve certain characteristics, such as durability or the ability to recycle media after it has reached its end of life, but with growing media representing between 5 percent and 10 percent of variable costs, there would need to be substantial improvements in performance or decreases in costs to make a large difference to the production economics. Growing medium is important in terms of resource use, as some substrates (such as perlite) are very energy-intensive to produce. Developments in aeroponic systems may help address some of these concerns about the full life cycle environmental impacts of indoor farming. Another major area of innovation is in the continuous monitoring and control of crop and environmental variables. While the fundamental aspects of crop production are generally well developed, the advent of remote sensing instruments and the ability to process and analyze tremendous amounts of data are creating fertile ground for innovation. Global investment in indoor agriculture/vertical farming ventures that fall outside the “traditional” agricultural sector has totaled approximately US$173 million over the past three years. This investment has fueled an impressive growth in new production space in urban centers throughout the United States and Canada. Based on publicly-available figures, vertical farms will total approximately 1 million square feet by the end of 2016. As described earlier this study, greenhouses run the range from low-tech, plastic structures used to extend the growing season in northern climates to mechanized and automated Dutch-style glasshouses, which are virtually indistinguishable from vertical farms in terms of advanced technology. In this sense, vertical farming is more of an evolutionary step in crop production rather than a break with the past. This conclusion is supported by the fact that the most successful firms (at least in terms of attracting capital) are essentially wholesalers, who happen to be located closer to the urban core than traditional producers. Any analysis in this report that compares vertical farming with traditional greenhouses will only address the hi-tech kind, as shown in Table 2 below. Table 2. Estimated new vegetable greenhouse area and investment since 2014: Canada and U.S. The current estimated North American market potential for vertically-grown crops is $30-$50 million. This figure is substantially lower than other estimates, and bears some additional explanation. First, the scale of traditional field agriculture is far larger than many of the advocates deeply involved in vertical farming acknowledge. While urban farming in many cases is a welcome addition to the overall food system in North America, the extent of land-based agriculture outside cities dwarfs the area currently suited for vertical farming by several orders of magnitude. In addition, the smaller footprint of urban operations creates a disadvantage when other space-using factors, such as packing lines, storage, and room for workers to move around are considered. For example, a 10,000 square foot warehouse may only be growing on half of that footprint when all the space for supporting functions is considered. Compare this to a traditional open field operation with potentially hundreds of contiguous acres funneling into a relatively small packing shed, and it becomes clear that the claims of extra growing space in vertical farms could be overstated. Second, the range of crops typically grown in indoor environments is limited to a small number of short-season, usually leafy green crops. Crops such as winter squash, melons, and tomatoes simply take a long time to reach maturity, and therefore do not obtain much advantage over lower-tech production methods. A third point, related to the above, is whether commercial buyers will be willing to pay premium prices for what is basically equivalent to field-grown product. Indoor-grown product may have advantages in terms of food safety, and possibly a lack of pesticide residues, but flooding the market with salad mixes is not a sound market strategy. Finally, vertical farms will experience fierce competition from existing market participants. In some cases, these companies are entering close-in urban markets on their own. These companies have considerable expertise, established relationships with buyers, and are well-capitalized. For the reasons listed above, vertical farms will be most likely to generate sales by filling in existing gaps in fresh produce supply. By definition, this is a niche market for now. Vertical farms can proactively manage production so that they are not competing with low-price competitors during these periods. For example, in late March 2014, the New York market price for iceberg lettuce was roughly $10 per carton (42 cents per head), a price very few, if any, vertical farms would find profitable. Four weeks later, the local market price was over $20 per carton (83 cents per head). By switching production so that a different crop with different price dynamics is being harvested in this period (such as peppers or tomatoes), a vertical farm can take advantage of favorable pricing in a way that traditional field and greenhouse producers, because their production is more subject to seasonal constraints, may not. Vertical farming has long been a niche market. Suppliers of controlled environment equipment have been marketing products to small-scale, research, and home growers since the 1970s. Many of these names are still in the business of supplying growers, such as Hydrofarm and General Hydroponics, both based in the San Francisco Bay Area. At least one current vertical farming business, Michigan-based Green Spirit Farms, got its start using home-scale equipment. While vertical farming represents a tiny proportion of vegetable production in the U.S. and Canada (representing perhaps $50 million in a $60 billion market), the 600,000 square feet of new growing area added over the past three years represents roughly four percent of total recent high-tech greenhouse segment growth in difficult-to-develop urban cores, an impressive achievement considering the industry didn’t exist a decade ago. Industry observers cite the following major developments in vertical farming, which can be broken into two categories: market trends and technological developments. Vertical farming enterprises are currently oriented toward several high value segments, along with more socially-conscious operating models. Key existing segments are hyper local, high-end retail grocery, and restaurant/food service innovations. High-end retail grocery stores serve a customer base that is already willing to pay a premium for high-quality, hard-to-find produce. Due to the specialty nature of many leafy greens (aside from lettuce and spinach), many varieties are stocked at irregular intervals, or their quality may sometimes be dubious. Indoor farms are an ideal supplier of these types of products, because they can be grown year-round at a more managed scale than can be obtained in open field conditions. Fresh produce niches are very trend-driven, and farm operations constantly aim to find products just on the verge of breaking out. Microgreens, mentioned earlier in this report, are one example of a current trend, as are specialty peppers such as the Padrón. While these types of products often seem to come from out of nowhere, they are in many cases the result of careful planning and cultivation of influential personalities, such as prominent chefs, produce buyers, and food writers. Numerous examples of this approach have been successful in recent years, especially when part of exclusive deals, such as the rollout of the “Sumo” citrus variety, which for several seasons was sold only at Whole Foods Markets, or the Honeycrisp apple, which was initially introduced on a limited basis, selling for as much as $2 to $3 above the price of other varieties. Emerging niches are often local in nature, at least initially. This is a critical time for early movers: for example, in the early 1980s, the founders of the California Endive Company almost singlehandedly created the U.S. market for Belgian endive, and for decades they were the only serious commercial grower of the vegetable in North America. When testing out ideas for new, promising products, a strategy that has been demonstrated to be effective is to work with local food community thought leaders. These differ by region, but food publications such as the Edible Communities chain of local magazines in Canada and the U.S. (http://www.ediblecommunities.com/content/), and culinary networks, such as the Chefs Collaborative (http://www.chefscollaborative.org/hello/) and Oldways (http://oldwayspt.org/) are a reliable source for emerging food ideas. The figures above may vary depending on how one defines a true vertical farm. Indeed, some growers simply consider themselves to be equivalent to traditional wholesale growers. In this case, we favor a more conservative estimate. The profitability of the vegetable market segments in this report are summarized in Table 4, below, along with notes particular to each market. Fluctuates constantly. For the foreseeable future, crop prices will reflect the integrated North American market. As a result, the profitability of a given crop will depend on the time of year and amount of supply from other sources (e.g., California, Mexico, GH and field grown produce from Canada). Exclusive new varieties may provide a differential advantage The wholesale produce market is highly competitive. The most reliable way to maintain profitability is to produce differentiated product during time periods where supply is typically limited. The ability of indoor-grown crops to command premium pricing is still unknown in the long term, especially considering traditional greenhouses have already filled in many gaps in the supply Efficiency, low-cost, and service are key. Whether a product is grown in a vertical farm, a conventional greenhouse, or in the field, customer needs are essentially the same, as the products themselves are often interchangeable. Vertical farm-grown produce has a potential advantage to the conventional supply chain in the important area of product quality (essential for fresh produce). To the extent the product can be delivered to its intended market in a shorter period of time, then consumers would presumably prefer vertical farm-grown produce to other varieties. One thing to consider is that, while the end consumer does indeed drive the market, the real customer of a grower/distributor is the produce buyer at the retail outlet. While developing a strong consumer brand is very important, firms that develop strong relationships with retail buyers will maintain a distinct advantage by making the produce buyer look good. Shorter supply chains are a major selling point of vertical farm operations. While this may be literally true in the sense of how far food travels, from the standpoint of consumers and retail buyers, what really matters is that the product is where it needs to be at any given point in time. If a vertical farm cannot profitably deliver product on time to customers a few blocks away, food miles are irrelevant. Recent startups, such as Good Eggs and Farmigo, have miscalculated the importance of strong logistics in their business models. In the case of Good Eggs, this resulted in a major pullback from national markets in what was a very costly reset. In the case of Farmigo, the owners simply left the market altogether, leaving behind many disappointed customers. Profitability in the fresh produce sector comes down to the key fundamentals described above. Aside from superior operational performance, differentiating factors such as exclusive varieties, branded packaging (or private label packing), and out-of-season produce can all contribute to obtaining higher margins on product sales, as well as keep throughput high enough to cover fixed costs. One interesting recent development in vertical farm business strategy has been pioneered by Bright Farms, which began by securing long-term supply deals with retailers. This allowed the company to obtain financing to build the facilities that would not have been available without the security of a long-term source of revenues. Vegetable demand is constantly evolving. Recent trends in North American per capita vegetable consumption are shown in Table 5 below. While they do not appear in Table 2.7, fresh herbs are reportedly seeing significant growth as well. Crops suited for indoor production are shown in bold. While the produce markets that developed over the past century still exist in some cities, the image of buyers down at the loading dock, looking over pallets of lettuce and tomatoes at 2 o’clock in the morning has been replaced by corporate purchasing agents entering into long-term supply contracts with integrated grower-shippers located in key distribution centers around North America for most high-volume products. Some vertical farming startups cite the act of “cutting out the middleman” as a competitive feature of their business models. This does not always translate into improved producer margins or consumer value. Eliminating the actors in the middle of the supply chain does not eliminate the work, it just transfers the workload somewhere else. If a company does not obtain a distinct advantage from doing this, then cutting out the middleman can be costlier or less efficient. The grower-shipper model came into dominance by outcompeting local growers and distributors on price, quality, and service. While produce growers and logistics firms may technically be independently owned, from the standpoint of produce buyers, the process is seamless and efficient. Three of the 16 vertical farming operations profiled in Part 1 of this study participated in some form of direct marketing to consumers. Montreal-based Lufa Farms and Moncton, N.B.-based Atta Farms sell some of their products via weekly basket services, which are distributed to local delivery points such as cafes, yoga studios, and restaurants. This allows the businesses to capture more of the retail value of their products but, as mentioned above, this also incurs extra marketing, packaging, and transportations costs. Both companies partner with other regional food producers and artisans to provide additional goods to customers, which may help spread the distribution costs across a larger number of vendors. Eleven of the 16 vertical farms focus on wholesale market sales. Some of these also supply food service distributors who sell to restaurants and institutions such as hospitals and schools. These companies include two of the largest vertical farming operations in North America, AeroFarms and Bright Farms, both located in the New York market. BrightFarms established itself in 2011, early in industry terms, by establishing long-term supply agreements with grocery retailers. These agreements allowed the company to secure funding for the construction of new growing facilities. Some vertical farming operations are intentionally staying small for the moment, choosing either to grow incrementally and fund their growth through operating income, such as Seattle-based Farmbox Greens. Farmbox directly supplies restaurants in the Seattle area. Others, such as Garfield Produce in Chicago and Green City Growers in Cleveland, were established in partnership with local community development organizations, and are deeply involved with issues such as food security and creating higher-paying jobs. Still another enterprise, The Plant in Chicago, was founded by a serial entrepreneur with longstanding interests in resource recycling and technology, and uses the vertical farming operation as a platform for education and outreach. These might best be considered separately from the commercial models described above, but could still provide some guidance for the development of projects on a case-by-case basis. The major competitors in the food crop segment are the existing grower shippers, such as Apio, Bonipak, Del Monte Fresh, and Duda, all well-established in North America and in some cases worldwide. Other major players include distributors such as U.S. Foods, SYSCO, and Frieda’s, along with dozens of other regional outfits. 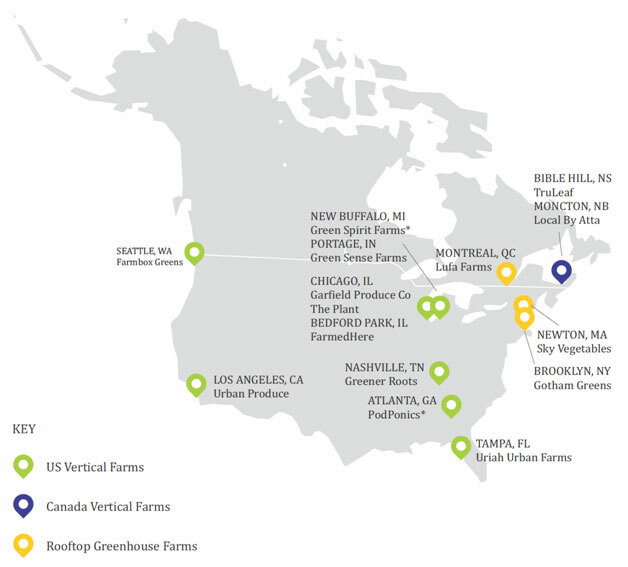 Within the vertical farming sector, competitors vary by region. For this reason, we believe some markets, such as NYC and Chicago, are less desirable for new entrants compared to areas where there has been little market penetration to date. Competitive strategies in this segment are profiled in more detail in the Distribution section above. AgFunder. Ag Tech Investing Reports (2014, 2015, and 2016). Includes farming enterprises and allied industries.